Cast clay; 30mm x 4mm/3.9gm. At this size and weight, it was certainly from a small drinking cup used by the servants. Seller's Note/ Unlike Terra sigillata that was used by Roman elites as serving plates and vessels to show off their wealth and taste, black-burnished ware was used in the kitchen for cooking. This is an excellent example of such cooking ware. Oddly enough, such fragments are more scarce than terra sigillata! Always desirable to Roman collectors, such pieces look great in shadowboxes. 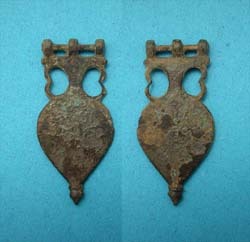 Lamp Hanger and Chain, c. 2nd-3rd Cent. Table Knife Handle, c. 2nd-4th Cent.